Mercedes Clemens of Gaithersburg is not the first massage therapist to receive a cease and desist letter with threats of fines and more, but if she succeeds in court, she could very well be the last to receive such a letter. 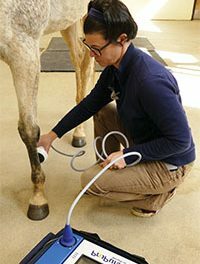 It has become apparent to the staff of The Equiery that over the years, equine dentists and other nonveterinary animal wellness professionals have chafed under Maryland’s strict Code of Veterinary Practice, which essentially prohibits anyone from practicing any sort of animal physical wellness or therapy unless under the “direct” supervision of a licensed vet. Under this code, certain health care professionals–such as farriers, individuals caring for their own horses, vet techs and acupuncturists– are exempt. Some dentistry is exempt, some not (see sidebar). Acupuncturists must be licensed to practice on animals by the State Board of Acupuncture as well as meeting other strict criteria within the Vet Code. Currently, the Maryland State Board of Chiropractic Examiners licenses massage therapists who work on humans. Mercedes Clemens notes in a June 10 press release and on her website that she is a licensed human massage therapist under the State Board, is privately certified in equine massage and is a Certified Equine Body Worker®. Unlike acupuncture, there is currently no license requirement for animal massage under the governing human board equivalent. This is not the first incidence of The State Board of Veterinary Medical Examiners sending cease and desist letters to “alternative” care professionals, including dentists; both The Equiery and the Maryland Horse Council have been contacted by health care practitioners who have received such letters. In the case of massage therapists, we have learned that they are often able to quickly resume practice by deleting a word or two from their marketing and including some sort of disclaimer (those therapists have been invited to share their stories in future issues). Over the years, the MHC and other organizations have been asked to lobby to modify the regulations, a lengthy and often grueling process. Other than the accupunturists, who lobbied for their own modifications to the law, Maryland’s other complementary and alternative equine health care professionals are still working to organize themselves so they can present a cohesive proposal and one voice. Will Clemens’ suit succeed in overturning Maryland vet law? Or is this a beginning of a dialogue that will ultimately amend the law? 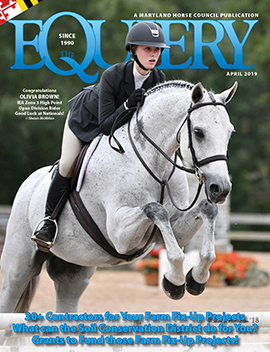 The Equiery invites readers to share their experiences and thoughts on this issue, and will continue reporting on this topic in future “News & Views” columns. In the meantime, please visit equiery.com for more information. Mercedes Clemens is a co-founder of The Equiery and was its art director for 15 years before retiring to practice massage.